Aerospace engineering student Jill Joffe has been selected for a National Science Foundation Graduate Research Fellowship. Joffe, who is from Huntsville, will graduate in May. In the fall, she will pursue graduate study in mechanical engineering at Purdue University with the Rhoads Research Group under the advisement of Jeff Rhoads. Her project, "Demonstration of the Ability to Stand-Off Acoustic Waves to Induce Heat in Plastic-Bonded Mock Energetic and Energetic Materials," looks to improve the detection of hidden improvised explosive devices (IEDs) at significant standoff distances. Her work will examine the use of acoustic excitations to cause plastic-bonded explosives to generate detectable amounts of heat without causing ignition. 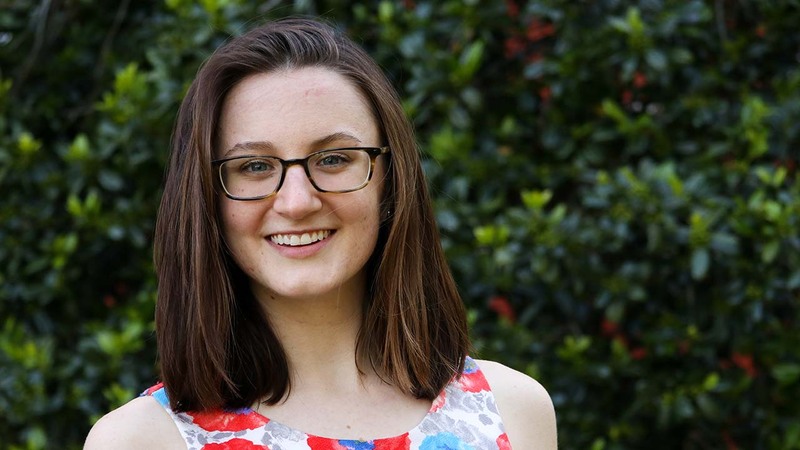 Joffe has formerly served as a peer instructor for the Women in Science and Engineering Learning Community (WISE) and is a founding member of the student media organization Humans of Auburn. Currently, she serves as a Cupola Engineering Ambassador and as academic chair in her sorority, Alpha Omega Epsilon. WISE Coordinator Bonnie Wilson, who nominated Joffe for the award, said the selection comes as no surprise, citing not only Joffe's 4.0 GPA, but also the contributions she's made to the people around her. "Jill is very passionate about the human experience - which, unfortunately, is perhaps not what one first imagines when they think of a prestigious student in aerospace engineering." said Wilson, who met Joffe when she was an Auburn freshman. "She is exceptionally bright and a great student, but she really cares about serving her fellow students, being mentored, mentoring others and spreading and sharing an appreciation for diversity." Joffe is one of 2,000 NSF awardees for 2018, selected from a field of 12,000. An NSF GRFP provides three years of financial support accessible over five years. Each year, the fellow receives a stipend of $34,000 and a $12,000 cost-of-education allowance to the graduate institution. That fellowship is for graduate study that leads to a research-based master's or doctoral degree in a STEM field.